England flanker Lewis Moody has refused to rule out a possible return from injury against his former club Leicester on Saturday. 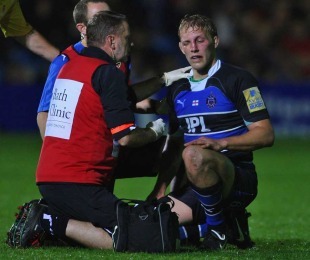 The Bath openside has been out of action since sustaining an eye injury in his side's defeat to Gloucester on October 1 - placing his involvement in England's November internationals in doubt. He has given cause for renewed optimism after confirming that he has a chance of making a comeback against the Tigers - his club for 14 seasons prior to last summer's switch to the west country - also putting him back in the frame for England's meeting with the All Blacks on November 6. "We are just taking each day as it comes but, as it is, the injury keeps getting better and better," he told Sky Sports News. "Hopefully I will be fit as I will be very frustrated if I miss that one, so we will see how it goes. "At the time I was probably a bit nervous, particularly after the game. I had virtually no vision out of that eye but thankfully I woke up the next day and that had all changed, so it has been a quick process and I has been ever since. I have been amazed at the speed of the recovery. "I am being cautious but I am still hopeful that I will be fit for the internationals and autumn series. Touch wood that's the case and everything keeps going in the manner that it has been."